I have been reading up on different subscription services, things like Stitchfix. I did two rounds with Elizabeth & Clarke, but after a closet overhaul I realized that I don't have much need for those types of tops. When I saw an ad for Fabletics(<-my referral link, full disclosure), a monthly workout outfit subscription service, I was intrigued. It is a premium fitness apparel brand developed by Kate Hudson. I am hoping to get back into running, as I have a goal of running the Disney Marathon in January 2015. I purged a ton of workout clothes that no longer fit, and I thought Fabletics would be the perfect way to get excited about hitting the gym again. 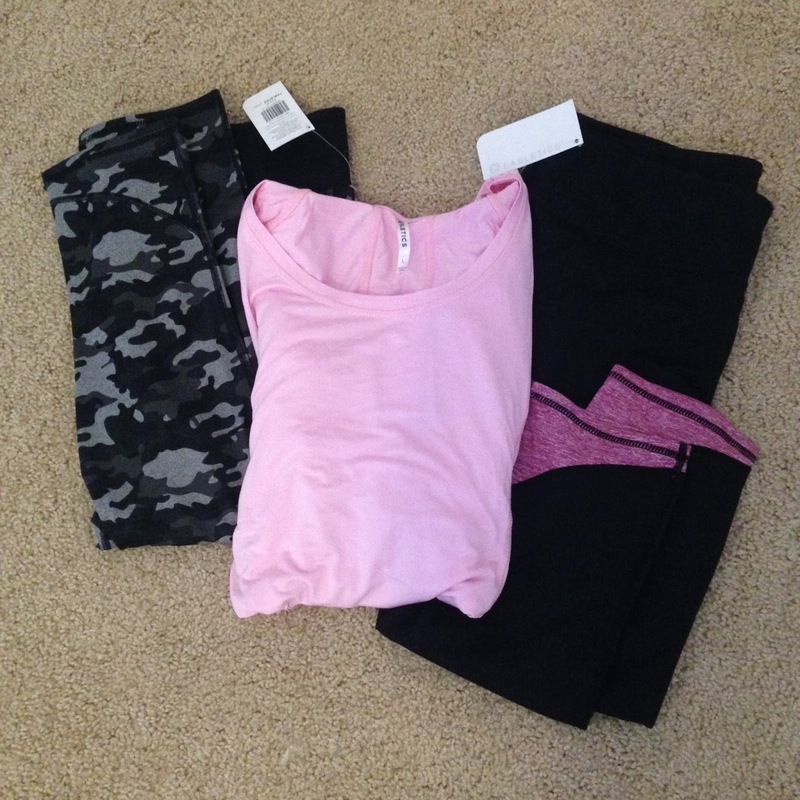 I got a great deal on my first outfit (50% off) plus I ordered a pair of camo print capri leggings. $56 for all the pieces. I received my first outfit not long after. I was really impressed by the quality of the items! The camo print capris are my absolute favorite, and I can't wait to wear them. They are thick but stretchy, and I didn't have to pay Lululemon pricing. Oh, and here are the new running shoes I just got! I went to my local Fleet Feet for a custom fitting/consultation and these are where I ended up. I also got some inserts for my arches that I'm trying out, based on my consultation. New shoes, and Fabletics pants! Disclaimer: I subscribed to Fabletics on my own, and did not receive anything in exchange for this review. If you're interested in signing up for Fabletics, I would LOVE if you'd use my referral link! For every two friends you get to join, you can earn an outfit. Ooh, I've never heard of this line before, thanks for the review! I am all about Target pricing for workout items but would like some more stylish options. I really like that you don't have to buy if you don't want to (just skip the month), and I also like that you can buy pieces "a la carte" like my camo pants. I'm gonna stick with it for a while and see how it goes! I will also update this post with a review of my two exchanged items too. They've held up to two washes and multiple wears for running!